European Culture- It’s Not All The Same! Can you provide us a training program on European Culture? 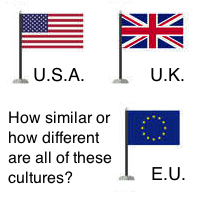 How about the U.S. and U.K. cultures? The image to the right showcases three flags. The U.S. flag represents American culture, the E.U. flag to represent cultures of the European Union (and Europe, though not all countries in Europe are in the E.U. ), and the U.K. flag to represent British culture (due to the recent Brexit, Britain and the U.K. has left the E.U.). Also, take note that the U.K. is an island nation made up of England, Scotland, Wales and Northern Ireland. Each of these areas have their own flag. Ask my American born friends who have lived extensively in the U.K., and they will tell you the culture shock they faced between these seemingly similar countries. Americans living in the U.K., have also written books specifically for the British to understand the confusing American business culture. If such books are needed, then there is a just cause to say these cultures are not the same. While European countries, like many Indian states have many commonalities, there are definitely variations in the national cultures of each country in Europe. While many agree food and language vary (for instance, some argue finding a good pizza is not possible in Germany as it is in Italy), some may still believe that some of the softer sides of the cultures are similar. Greetings, restaurant mannerisms, costs of living, and even toilets can differ from country to country in Europe, so obviously how people do business will differ slightly or widely as well. I came across a video made by Wolter’s World on YouTube. Wolter is from the U.S. I think Wolter travels frequently to many European countries for business, pleasure and bleisure. Earlier I have shared Wolter’s tips on What Not to do in an Airport. Today, let’s learn about European vs. U.S. culture based on Wolter’s experience. The tips provided will help business travelers from the U.S. or even India to Europe to gain a basic understanding of some of the infrastructure and mannerism differences in various areas of Europe. Below the video is a short outline of the topics discussed in the video. Language tips for traveling around Europe. English is the defacto language, but local language common phrases are useful. Money – American money vs. European money. Take note that Euro coins are worth something, unlike US coins. How to pay in Europe – Cash is more common than credit cards. Tipping etiquette in different European countries. Electronics & plugs – What you need to know about electronics in the EU. Toilets in Europe. Interestingly, he showed a squat toilet like the ones you find in India. I am not sure exactly where in Europe these toilets are found! Can you drink the water in the EU or Europe? Free wi-fi is common in the U.S. Can you get Wi-Fi in Europe? If you or your team would like to be in touch with Authentic Journeys for your cross-cultural training needs, contact us today. Thank you for spending your time here. Take note: If there are any factual inaccuracies regarding the U.K. or the E.U. noted in this article, please let me know in the comments section. Thank you. An Indian (from Kerala) shares his experience working in the U.K.